I am a beauty products junkie. I’m aware of this terrible problem. My husband dies when he sees all the random stuff I buy to try to “beautify” myself! I love sugar scrubs but hate spending tons of money on them, so after some research, I threw this concoction together and LOVE it! Found this old candle jar for $1! 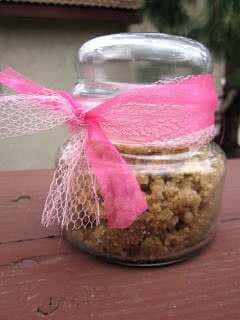 You could find a jar at home and put a cute ribbon on it as a little gift for a girlfriend! I know I would love it! The best part is that there are 4 ingredients! AND you already have them in your pantry! Mix all ingredients together and you’re ready to go! If you want it to be not as thick, you could add more olive oil or add less of the sugar. I found these quantities worked pretty good though! And the vanilla and brown sugar give it a delicious smell! I am totally trying this! Thanks Lu! Thanks for shareing, I'm going to have to try this! And thanks for stopping by my blog! sounds great, inexpensive and easy...but Does it Really Work?? Hi! I would love to try out this idea! This question is really dumb but where exactly do we put the scrub? Face or body? We have used it on our body. Works great on your heels. We have put it on our faces before too.